The S&P 500 climbed to all-time highs on Monday, notching its first record close since August. The index is now up nearly 3% since Donald Trump's election. The Dow also hit a new high, taking it closer to the 19,000 level. The Nasdaq, which struggled initially after the election, also rose to a record high on Monday, its first since September. 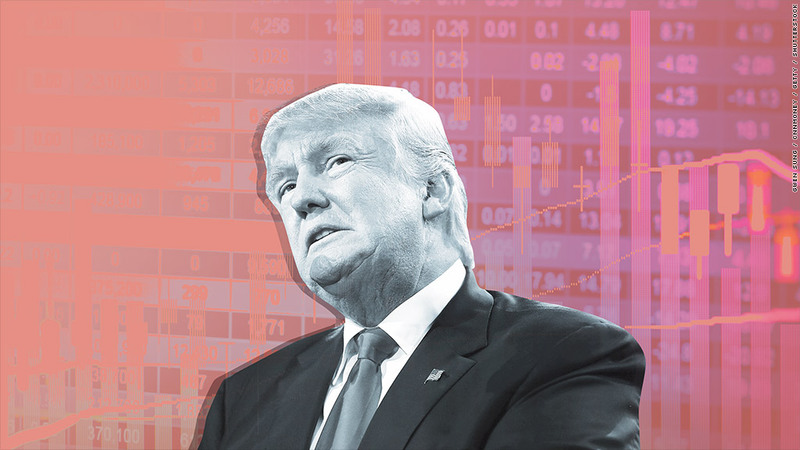 Many predicted stocks would plunge, or even crash, should Trump upset Hillary Clinton. Initially that did happen, with overnight markets plummeting the night of the election. Yet that freakout proved short-lived, with stocks racing higher on Election Day. Instead of focusing on fears that Trump could start a trade war, investors are hoping the president-elect will unleash the U.S. economy by cutting taxes, rolling back regulation and ramping up infrastructure spending. "The basis for the rally is optimism about reversing Obama-nomics -- raising taxes and increasing regulation," said Peter Boockvar, chief market analyst at The Lindsey Group. The rush to buy stocks has helped cause bond prices to tank dramatically, driving up borrowing costs for mortgages. The U.S. dollar is also now sitting at a 13-year high, making products sold by companies like Nike (NKE) and Apple (AAPL) less attractive to overseas buyers. Pointing to the stronger dollar and rising borrowing costs, Boockvar said, "One has to wonder how long this euphoria will continue."